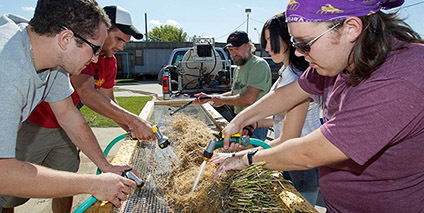 Preserving intact prairie roots starts by growing the plants in specialized pots. A “big pots” facility was constructed for this purpose at the University of Northern Iowa in 2009-10, with a grant from the Living Roadway Trust Fund (LRTF). 10’ long sections of 12” diameter PVC pipe, buried vertically. 10’ long sections of 10” diameter PVC pipe, sliced lengthwise, then held together with hose clamps and duct tape. The pots are inserted in the 12” sleeves. Pots are filled with Turface®, a crushed-clay material typically used on baseball fields. Prairie plugs are planted in the big pots. A fertigation system (fertilizer + irrigation) keeps the plants fed and watered. After two to three seasons, the pots are pulled out of the ground with a backhoe lift, lifted onto a screen table, and split open. Roots are washed and labeled, then soaked in a glycerine-acetone-ethanol solution (2:1:1) for one week. Preserved roots are then hung to air-dry. We continually experiment with new methods to improve the quality of the specimens. THE PEOPLE: Until 2015, the Big Pots Facility was the responsibility of a graduate student in the Department of Biology. With support from the Living Roadway Trust Fund, the following grad students maintained the facility and coordinated the harvest and preservation of the prairie roots.Beginning in 2015 the project was coordinated by TPC staff.